Impact 100 has always been about making a difference – both for the nonprofits to whom they offer grants, and among the Indianapolis community at large. In the last six years, Impact 100 has been making a difference in shaping the philanthropic perspectives of young women through its scholarship program, which covers the cost of membership for promising young philanthropists. 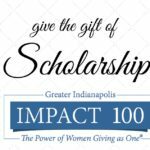 In 2015 the Impact 100 Board decided to expand the scholarship program to ten recipients as a way to celebrate our tenth anniversary, and generous donors stepped up to donate the additional $10,000 needed to pay for their membership. The program was so successful the Board decided to make it an annual endeavor with the number of scholarship members determined by the amount of donations into a special Young Philanthropic Scholarship Fund created for that purpose, one scholarship for each $1000 in the fund on December 31 each year. As a way to introduce our Scholarship Members, we asked each to describe how they impact their Focus Area Committee (FAC) and explain their dream philanthropic project. Because 20 is a lot of people to meet all at once, we’ll introduce them four at a time. Click here if you’d like to make a donation to the 2019 Scholarship Fund. This entry was posted in Impact 100 in the News, Member Feature on March 30, 2018 by Impact 100 Indy.